OK, but they're spending too much money. Surely they know they have to cut back? Sure, but the deals on offer are pretty unattractive. Europe wants to forgive half of Greece's debt and put them on a brutal austerity plan. The problem is that this is unrealistic. Greece would be broke even if all its debt were forgiven, and if their economy tanks they'll be even broker. But that's the prospect they're being offered: a little bit of debt forgiveness and a lot of austerity. But it puts Greece into a death spiral. They can't pay their debts, so they cut back, which hurts their economy, which makes them even broker, so they cut back some more, rinse and repeat. There's virtually no hope that they'll recover anytime in the near future. It's just endless pain. What they need is total debt forgiveness and lots of aid going forward. I certainly agree that Greece is now in a death spiral, but this analysis is just amazing. The only way for other countries to avoid sharing Greece's fate is to, very simply, spend within their means. If they do, problem avoided. If they don't, and get hooked on deficit spending, then Greece is their future, the only question is when. And it is amazing to me that he calls forgiving half their debt, the equivalent in the US of our creditors erasing about $7 trillion, as "a little bit of debt forgiveness" while cutting government spending a few percent of GDP is "a lot of austerity." His solution, of course, is not for Greece to face up to its problems but to transfer the costs of its irresponsibility to others and then remain nearly perpetually on the dole. His mistake is to assume Greece faces endless pain. It does not. History has shown that countries that are willing to rip off the bandage quickly rather than over a few decades can recover remarkably quickly if sensible policies are put in place. Heck, the Weimar Republic, which had inflation so bad people got paid 3 times a day so their family could buy something before the money became worthless a few hours later, got its house in order in a matter of months. I am amazed at the equity rally over this. Writing down one country's debt, without fixing its underlying financial problem or dealing with all the other countries who have problems, seems a small win. Particularly when this one country stretched European resources to the breaking point, and there are a lot of other lined up just behind Greece. Its interesting to see how much everyone bent over backwards not to trigger payouts from credit default swaps (CDS). If this is the wave of the future, I would be shorting sovereign debt at the same time I was writing CDS contracts on sovereign debt. Maybe this is exactly why I am not a trader, but it strikes me that if you had an arsonist around burning down houses, while at the same time the government worked hard to let fire insurance companies avoid paying off on the fire damage, wouldn't you be shorting houses and long on fire insurance companies? How smart does the UK feel right now for staying out of the common currency? The anti-EU folks in the UK should be calling for that referendum on EU participation right now. It would likely fail by a landslide. The question that keeps nagging at me -- is it really worth as much as a trillion euros to keep Greece in the Euro? Why? When sharing our kneejerk reaction to yesterday's latest European resolution, we pointed out the obvious: "Portugal, Ireland, Spain and Italy will promptly commence sabotaging their economies (just like Greece) simply to get the same debt Blue Light special as Greece." Sure enough, 6 hours later Bloomberg is out with the appropriately titled: "Irish Spy Reward Opportunity in Greece’s Debt Hole." Bloomberg notes that Ireland has not even waited for the ink to be dry before sending out feelers on just what the possible "rewards" may be: "Greece’s failure to cut spending and boost revenue by enough to meet targets set by the European Union and International Monetary Fund prompted bondholders to accept a 50 percent loss on its debt. While Ireland won’t seek debt discounts, the government might pursue other relief given to Greece, including cheaper interest payments on aid and longer to repay it, according to a person familiar with the matter who declined to be identified as no final decision has been taken." Democrats are labeling any plans that would cut or even flatten Federal spending as the "austerity" option. They use the word austerity to imply an unusual and radical reduction in spending which evokes proposed plans in places like Greece that has all the government workers marching in the street. But Greece is trying to find a way to move to a fiscal regime they have never even experienced, not in any of our lifetimes and maybe never. In contrast, the US merely needs to move to a place it was way back in about 2006. 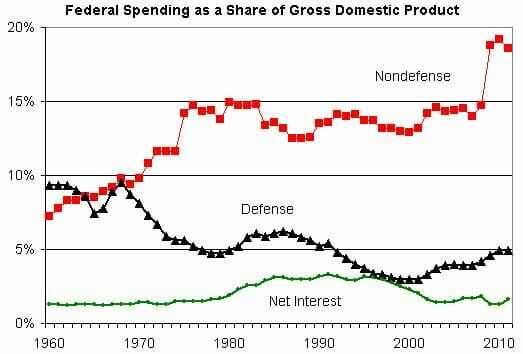 Yes, that's right, "austerity" is returning to the level of government spending we had five years ago. And we all remember what a blighted time that was, a veritable Mad Max desolation relieved only by Obama arriving like the Postman from the David Brin novel (or the execrable Costner movie, if you prefer). President Obama is working from the assumption that the political leader who suggests painful but necessary budget cuts first, loses. He had every opportunity to propose and pass a budget when he had Democratic majorities in Congress. But Democrats feared that showing leadership on the hard budget choices they faced would hurt them in the November election, so they punted. Even when Obama did produce a budget, it was the closest thing to a non-entity as could be imagined. A budget that doubles government debt over 10 years and raises interest costs (under optimistic assumptions) to a trillion dollars a year would likely be controversial in any year, but is a non-starter given fresh memories of debt crises in Greece, Ireland and a number of other countries. Of course there is an 800-lb gorilla in the room that no one wants to acknowledge: Three programs — Social Security, Medicare, and Medicaid — grow in the next 10 years under current rules to at least $2.7 trillion dollars a year. 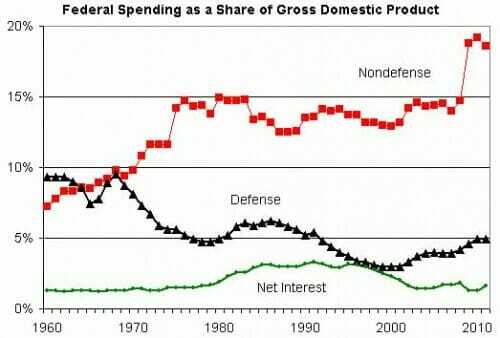 Recognize that this figure excludes all the other so-called non-discretionary payments (unemployment, food stamps, etc.) as well as everything else the government does including the military and Obamacare. The 2021 spending on just those three programs is 25% higher than the total revenue of the federal government from all sources in 2011. Later in the article, I suggest ten principles that should be the foundation of a budget deal. This is the response from the Left to a proposed 1.6% cut in the Federal budget, that would reduce the annual deficit by a whopping 6%. Greece here we come! The Senate is expected to vote this week on alternative plans to approve spending for the rest of this year. They will vote on whether to agree to the extreme cuts passed by the House (H.R. 1) - $65 billion less than last year's spending for domestic programs. The House bill will deny vital services to millions of people, from young children to seniors. Please tell your Senators to VOTE NO on H.R. 1 and to vote FOR the Senate alternative. The proposed Senate bill cuts spending $6.5 billion below last year's levels, compared to more than $60 billion in cuts in H.R. 1. Most of the extreme cuts in the House plan listed below are not made in the Senate bill. Please call both your Senators and tell them to VOTE NO on H.R. 1 and FOR the Senate full-year FY 2011 bill. Tell them to vote NO on harsh and unprecedented cuts that will deny health care, education, food, housing, and jobs to millions of the poorest and most vulnerable Americans, while at the same time jeopardizing the economic recovery for all. The Greek state was not just corrupt but also corrupting. Once you saw how it worked you could understand a phenomenon which otherwise made no sense at all: the difficulty Greek people have saying a kind word about one another. Individual Greeks are delightful: funny, warm, smart, and good company. I left two dozen interviews saying to myself, "What great people!" They do not share the sentiment about one another: the hardest thing to do in Greece is to get one Greek to compliment another behind his back. No success of any kind is regarded without suspicion. Everyone is pretty sure everyone is cheating on his taxes, or bribing politicians, or taking bribes, or lying about the value of his real estate. And this total absence of faith in one another is self-reinforcing. The epidemic of lying and cheating and stealing makes any sort of civic life impossible; the collapse of civic life only encourages more lying, cheating, and stealing. Lacking faith in one another, they fall back on themselves and their families. The structure of the Greek economy is collectivist, but the country, in spirit, is the opposite of a collective. Its real structure is every man for himself. Into this system investors had poured hundreds of billions of dollars. And the credit boom had pushed the country over the edge, into total moral collapse. My hypothesis is that what all the events precipitating the Tea Party movement share is that they demonstrated, emphatically and unconditionally, the depths of the absolute dependence of us all on government action, and in so doing they undermined the deeply held fiction of individual autonomy and self-sufficiency that are intrinsic parts of Americans' collective self-understanding. ....This is the rage and anger I hear in the Tea Party movement; it is the sound of jilted lovers furious that the other "” the anonymous blob called simply "government" "” has suddenly let them down, suddenly made clear that they are dependent and limited beings, suddenly revealed them as vulnerable. Do you get that - we oppose the overwhelming size of government not for any rational reason, but out of a psychological need to deny that the government is inevitably going to grow larger and increase its control over our lives. This is so absurd it is freaking hilarious. This is what Louis the XVI's sycophants were telling him to make him feel better in 1789. I mean, after 200 years of only limited government interference in health care, how is it that a law passed over majority opposition for government takeover of healthcare somehow "demonstrates the absolute dependence of us all on government action?" Why doesn't it reasonably demonstrate the depth of risk we all face from a minority who have constantly through history been bent on wielding power over us. So while he rejects the goofy psychobabble, he accepts the underlying premise, that any opposition to expansion of government and its power of coercion over individuals is irrational. So take your pick -- libertarians are either a) advocating limited government only as a psychological crutch to hide from ourselves that Obama is really our daddy or b) scheming reactionary nuts. Whichever the case, remember that there can be no principled opposition to Big Brother. Apparently the nations of Europe have committed their citizens to helping pay the inflated salaries of a bloated Greek public workforce to the tune of $146 billion. The package is predicated on the Greeks getting their spending under control, which almost certainly will not happen since the bailout establishes the precedent that if Greece fails to act rationally, it will get bailed out. This post and this post came up back to back in my feed reader this morning. The first explored per capita GDP between Greece and Germany, and wonders why the published numbers can be so close when visual evidence is that the average Greek is far less prosperous than the average German. Brian Caplan explains the largest difference between Greece and Germany in terms of public sector productivity, with 10% of the workforce in Germany working for the state while a third of Greeks do so. Knowing the Germans, it's easy to believe that its government employees accomplish as much as the Greeks' despite their smaller population share. This implies that 25% of the Greek labor force is, contrary to official stats, producing nothing. So using Sumner's other numbers - and assuming output is roughly proportional to labor force - per-capita GDP is more than 50% higher in Germany than Greece. First-hand observation tells me that's still an understatement, but it still closes a big chunk of the gap between official stats and reality. How's that for a mental image? UPDATE: The NY Times apparently overstated the 1/3 figure, see here. Back in 1990, Halstein Stralberg coined the term "automation refugees" to describe Postal Service mail processing employees who were assigned to manual operations when automation eliminated the work they had been doing. Since the Postal Service couldn't lay off these employees, they had to be given something to do, and manual processing seemed to have an inexhaustible capacity to absorb employees by the simple expedient of reducing its productivity. The result was a sharp decline in mail processing productivity and a sharp increase in mail processing costs for Periodicals class. Periodicals class cost coverage has declined steadily since that time. O'Brien then tells of visiting seventeen mail processing facilities as part of a Joint Mail Processing Task Force in 1998. During those visits he noted that the periodical sorting machines always happened to be down even though the machines were supposed to be operating seventeen hours a day. Although the machines weren't working, manual operations were always up and running. More Periodicals mail is manually processed than ever, and manual productivity continues to decline. Periodicals Class now only covers 75% of its costs. How can this dismal pattern of declining productivity and rising costs continue more than two decades after it was first identified, especially when the Postal Service has invested millions of dollars in flats automation equipment? Years ago, I briefly consulted to the SNCF, the French national railroad. I say briefly, because thought they technically asked us to benchmark them against US firms, its clear they did not really want to hear the results. The one figure that sticks in my mind is that they had something like 100,000 freight cars, but 125,000 freight car maintenance employees. I remember observing to a highly unamused SNCF executive that they could assign one maintenance worker to his very own freight car and still lay off 20% of the staff. And apparently France is an order of magnitude better on stuff like this than Greece. Medicare already faces a $30 Trillion deficit. The bigger issue is that Democrats are poised to make cuts in Medicare -- something that is incredibly difficult to do -- but instead of applying those cuts towards Medicare, they are applying it towards a lavish new entitlement program. Of course, that assumed that the spending estimates for the new health care plan are meaningful, which is highly unlikely, since every single entitlement of this kind has always vastly outspent its initial estimates. Greece, here we come. Is Greece the New Montreal? Hosting the Olympics practically bankrupted Montreal. Via Megan McArdle, Victor Matheson argues that the current Greek financial problems may have stemmed from hosting the Olympics. Greece's federal government had historically been a profligate spender, but in order to join the euro currency zone, the government was forced to adopt austerity measures that reduced deficits from just over 9% of GDP in 1994 to just 3.1% of GDP in 1999, the year before Greece joined the euro. But the Olympics broke the bank. Government deficits rose every year after 1999, peaking at 7.5% of GDP in 2004, the year of the Olympics, thanks in large part to the 9 billion euro price tag for the Games. For a relatively small country like Greece, the cost of hosting the Games equaled roughly 5% of the annual GDP of the country. Of course, the Olympics didn't usher in an economic boom. Indeed, in 2005 Greece suffered an Olympic-sized hangover with GDP growth falling to its lowest level in a decade. Hosting Olymics is just a super-sized version of the fallacy that causes governments to fund billion dollar sports stadiums.